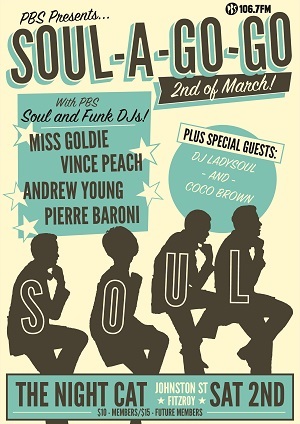 Soul A Go Go - March! Banging out the 45s and getting the dance floor jumping will be a classic line-up of PBS’ Andrew Young (Jazz on Saturday), Miss Goldie (Boss Action), Vince Peach (Soul Time) and Pierre Baroni (Soulgroove'66) plus special guests Coco Brown and DJ Ladysoul. Proudly presented by PBS 106.7FM Melbourne! Tickets at the door - $10 for PBS Members $15 for future members. This is a Bandmates Victoria friendly event. The Night Cat is a wheelchair accessible venue - see their website for details. This event takes place on the land of the Wurundjeri people of the Kulin Nation. We acknowledge elders of this land, past, present and emerging.